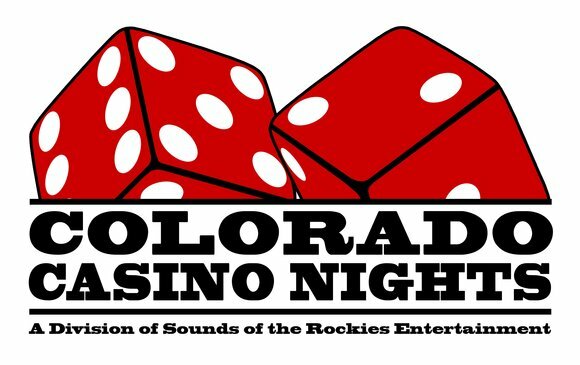 Colorado Casino Nights offers 7 Player casino size Blackjack table. This table is built using the same design and quality that is found on professional casino blackjack tables. Requires One Dealer. Check out our LED Blackjack Tables, too! Blackjack is one of the most popular casino card games in the world. Much of blackjack's popularity is due to the mix of chance with elements of skill, and the publicity that surrounds card counting (keeping track of which cards have been played since the last shuffle). At casino themed parties, this game is a hit! You cannot go wrong with Blackjack! Your guests will have a TON of fun. 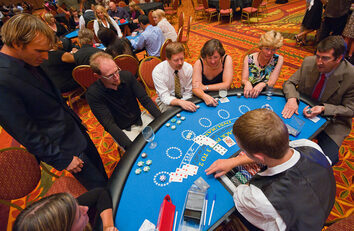 Remember: OUR DEALERS WILL TEACH ANY GAMES! Each player is dealt two cards. The hand with the highest total wins as long as it doesn't exceed 21; a hand with a higher total than 21 is said to bust or have too many. Cards 2 through 10 are worth their face value, and face cards (jack, queen, king) are also worth 10. An ace's value is 11 unless this would cause the player to bust, in which case it is worth 1. A hand in which an ace's value is counted as 11 is called a soft hand, because it cannot be busted if the player draws another card. The goal of each player is to beat the dealer by having the higher, unbusted hand. Note that if the player busts he loses, even if the dealer also busts (therefore Blackjack favors the dealer). If both the player and the dealer have the same point value, it is called a "push", and neither player nor dealer wins the hand. Each player has an independent game with the dealer, so it is possible for the dealer to lose to one player, but still beat the other players in the same round. The minimum bet is printed on a sign on the table and varies from casino to casino and even table to table. After initial bets are placed, the dealer deals the cards, either from one or two handheld decks of cards, known as a "pitch" game, or more commonly from a shoe containing four or more decks. The dealer gives two cards to each player, including himself. One of the dealer's two cards is face-up so all the players can see it, and the other is face down. (The face-down card is known as the "hole card". In European blackjack, the hole card is not actually dealt until the players all play their hands.) The cards are dealt face up from a shoe, or face down if it is a pitch game. Split: Double the wager and have each card be the first card in a new hand. This option is available only when both cards have the same value. Sometimes two face cards will be considered acceptable for splitting, as each is 10 points. Surrender: Forfeit half the bet and give up the hand. Surrender was common during the early and mid 20th century, but is no longer offered at most casinos. After all the players have finished making their decisions, the dealer then reveals his or her hidden hole card and plays the hand. House rules say that the dealer must hit until he or she has at least 17, regardless of what the players have. In most casinos a dealer must also hit a soft 17 (a combination of cards adding up to either 7 or 17, such as an ace and a 6). The felt of the table will indicate whether or not the house hits or stands on a soft 17.
one card split aces: a single new card is added to each Ace and the turn ends. They are thus regarded as 11-point cards. No other denomination is subject to this process. double-down restrictions: double-down allowed only on certain combinations of cards and usually only allowed if a hand consists of two cards. European No-Hole-Card Rule: the dealer receives only one card, dealt face-up, and does not receive a second card (and thus does not check for blackjack) until players have acted. This means players lose not only their original bet, but also any additional money invested from splitting and doubling down. A game that has no-hole-card doesn't necessarily mean you will lose additional bets as well as original bets. In Australia for example, a player beaten by a dealer blackjack may keep all split and double bets and lose only the original bet, thus the game plays the same as it would if there were a hole card. There are more than a few blackjack variations which can be found in the casinos, each has its own set of rules, strategies and odds. It is advised to take a look at the rules of the specific variation before playing. Many countries have legal acts and laws, which determine how a casino game of Blackjack must be played. If the dealer's up card is an Ace, the player is offered the option of taking Insurance before the dealer checks his 'hole card'. The player who wishes to take insurance can bet an amount up to half his original bet. The Insurance bet is placed separately on a special portion of the table, which usually carries the words "Insurance Pays 2:1". The player who is taking Insurance is betting that the dealer was dealt a natural, i.e. a two-card 21 (a blackjack), and this bet by the player pays off 2:1 if it wins. It is called insurance since if the dealer has a blackjack, the bet wins the same amount of the players Blackjack wager, such that if insurance is taken and the player doesn't have blackjack but dealer does, no money is lost. Of course the dealer can end up not having blackjack and the player can still win or lose the blackjack bet. Insurance is a bad bet for the player who has no knowledge of the hole card because it has a house edge of approximately 7%. Even for the player who has been dealt a natural (a two-card 21) it is unwise to take Insurance. In such a case, the dealer usually asks the player "Even money?" This means that instead of 3:2, the player with the natural accepts to be paid off at 1:1. Thus it is exactly the same thing as buying Insurance, losing the Insurance bet and getting paid 3:2 on the natural. In casinos where a hole card is dealt, a dealer who is showing a card with a value of Ace or 10 may slide the corner of his or her facedown card over a small mirror or electronic sensor on the tabletop in order to check whether he has a natural. This practice minimizes the risk of inadvertently revealing the hole card, which would give the sharp-eyed player a considerable advantage. In some countries, such as Australia, no face down card is dealt to the dealer until it is his turn to play his hand. This makes the game more complicated since the dealer must keep track of busted split bets since if the dealer ends up drawing a blackjack the players lose only their original bets and do not lose double or busted split bets. Because blackjack, unlike other games, has an element of player choice, players can actually reduce the casino advantage to a small percentage by playing what is known as basic strategy. This strategy determines when to hit and when to stand, and also determines when doubling down or splitting is the correct action. Basic strategy is based on the player's point total and the dealer's visible card. There are slight variations in basic strategy depending on the exact house rules and the number of decks used. In some LV Strip casinos you may still be able to find the older version of the multi-deck shoe game, where dealer stands on soft 17; those are usually high minimum ($50 or more) tables. This version is much more advantageous to the player, but requires a slightly modified basic strategy table (such tables can be generated using the external links).